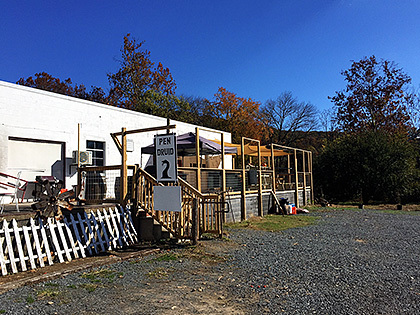 This past Friday, I decided to take a mental health day from the day job and pay a visit to Pen Druid Brewing in beautiful, quiet Sperryville, VA right next door to Wasmund’s and Copper Fox Distillery. It’s a quick 20-25 minute drive from Barley Blog HQ and with the leaves in full Autumn splendor, it just seemed like the ideal way to start the weekend. Pen Druid just launched this past Spring under the watchful eyes of three brothers — Lain, Van and Jennings Carney. 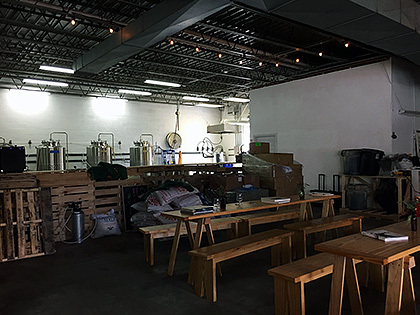 You can learn more about these adventurous brewers on their website. The wife and I chatted mostly with Lain as the other two brothers were busy readying new beers to be released later this week. 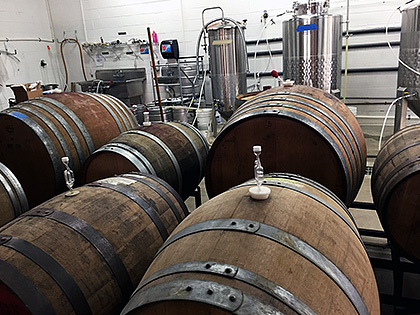 The goal of this small company is to craft barrel-aged, wild ales and, from what I tasted, there is definitely reason to be excited over what will be coming from these guys in the next couple of years. But first, we started off with their IPA because, you know, every brewery has to have an IPA — I’m pretty sure it’s a law at this point. 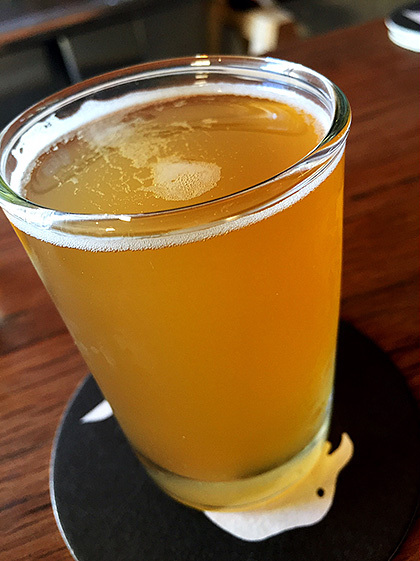 Anyways, Janis’ Southern Wrecker (pictured above) is a 4.6% ABV American IPA that hits all the marks required for the style. It’s got plenty of citrus notes, pine and a moderate bitterness. The beer is deceptively drinkable and finished clean with a lingering finish. Next up, and the beer I left with a full growler of, was their Mystic Lamb (above). At 4.9% ABV, this French saison was delicious. Lemon citrus notes, light banana, a soft funk and lively mouthfeel more than made up for a rather subtle nose. After the initial tastings, the wife and I both opted for a glass of this one before heading home. It’s about as good a saison I’ve had from any Virginia brewery. 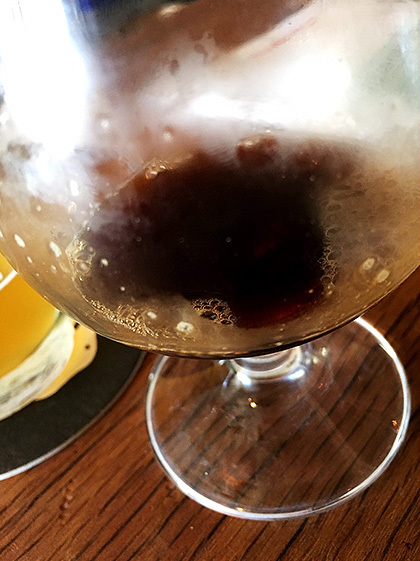 We also got a sneak peek at three beers, two of which were not quite ready for showtime upon our arrival and one that still had some barrel-aging to do. The first up was a not-so-traditional dark mild pictured below (Mild Child at 3.4% ABV, I think) that brought a wonderful amount of roastiness to the party. Had this one been ready, I’m pretty sure it would have filled a second growler. The second beer we got a sneak peek of was the most interesting beer, flavor-wise by far. 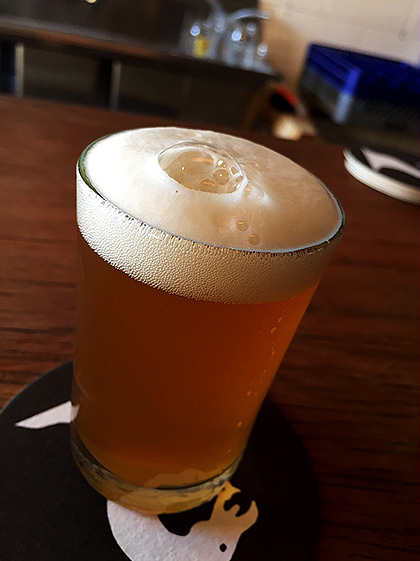 Brewed with a saison grain bill, this one employed a pilsner yeast to bring a dizzying array of flavors to the party. Appropriately named Wheels of Confusion, the beer presented hints of bubblegum, grape, light hop tingle and what could only be described as a fun character. The last beer we got a peek at was an unnamed 8% ABV barrel aged brew that teases at what these guys are capable of. We were lucky enough to have Lain pull the sample right from the wine barrel (chardonnay, I believe) it was resting in — after it had spent some time (6 weeks) in an Italian Sherry barrel. And this is where the excitement starts. The brothers have an assortment of barrels from Linden Vineyards and Rappahannock Cellars in addition to that night-black sherry barrel. 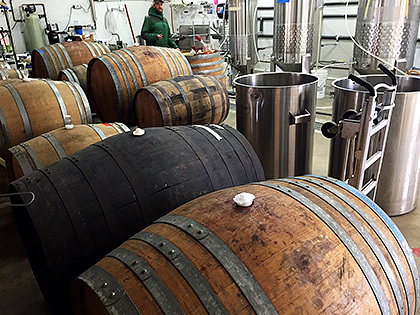 Brettanomyces and Saccharomyces are going to be used heavily going forward within all of these barrels. 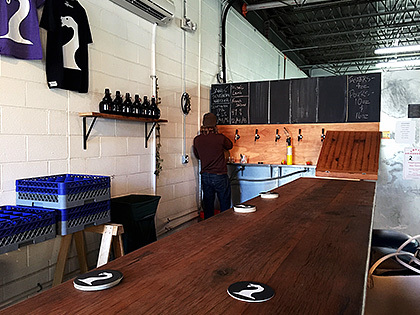 At the moment, the brewery is using cultured yeasts from RVA Yeast Labs, but they hope to start using their own proprietary blend in the near future. Also in the near future (like two to three weeks from our visit) the brewery will be perhaps one of two Virginia companies with a purpose-built coolship. Lying at the feet of the Shenandoah Mountains, there should be plenty of flora in the air to create some interesting brews. The wife and I had a good time enjoying some wonderful brews and chatting with the brothers. If they can tame all the yeast and barrels they plan to employ moving forward, there’s plenty to be excited about with Pen Druid. I’ll be heading back out there soon enough to check out that coolship once its installed.